When I fist saw mention of this book, what drew me to it was that I myself was a child of abuse and know firsthand the lasting effects this can have on one's life. Plus I learned that while she doesn't live here now, Irene Watson is originally from Alberta, Canada in a small community. Living in Canada myself, I thought this was pretty neat. Irene's book tells her stories from her childhood in a matter of fact way with real life advice and examples of strength on overcoming one's past to make the most of your future. I love how she was not overly negative in the book, she simply told how things happened and how they shaped her as a person. 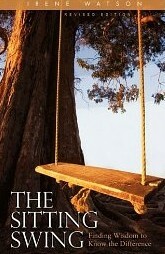 The major event in this book that resonated with me was the mental image created of The books name, The Sitting Swing. At one point Irene describes how she was allowed to play outside on the swing her dad had hung in view of the window so her mom could watch her. Her mom's words "Careful now. Don't swing too high," struck a chord as you picture a child sitting on a swing with a rosebush planted directly behind it. The placement of the swing was not intentional for torture, it was done more so her mother could keep a close eye on her. This theme overshadows the story in the book and is a masterful metaphor for so many elements in Irene's story. The words "Don't swing too high" were always in the back of my mind as I read through this book and imagined the dynamic between mother and child. Imaginee a child growing up in a small town, overshadowed by her brother's death living with an overprotective mother and distant father. This book starts off with Irene entering a treatment Centre (Avalon), for which she is not sure at first why she is there. Through some interesting adventures, Irene takes you on a journey of self discovery that results in her learning about herself and why she has struggled throughout her life, marriage and continues to do so. While recounting stories from her childhood Irene gives a touching account of how everything from her parents culture, upbringing, and challenges they faced formed her into the person she became and sent her on a certain path. Irene goes on to offer her readers faith in being able to re-write your path through her experiences at Avalon. Please note that while I was provided with a copy of this book and was compensated for writing this review, all opinions are 100% my own! Thanks to Irene Watson for this opportunity!